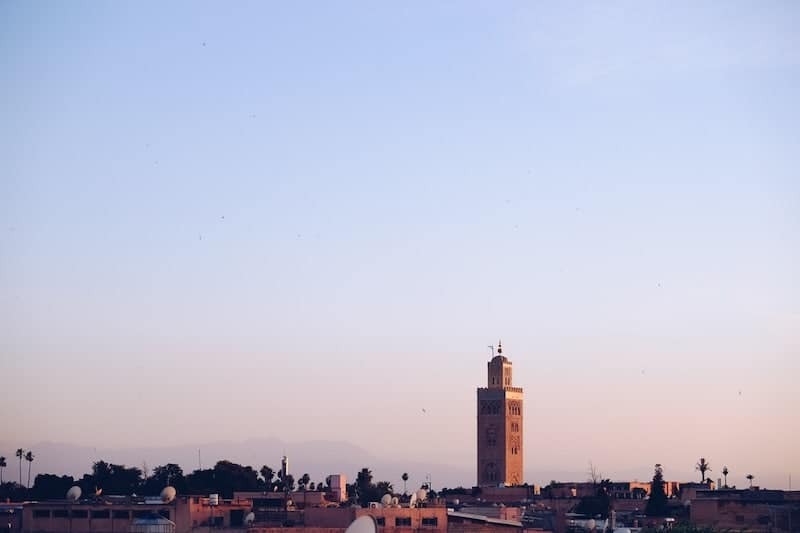 Marrakech, Morocco’s majestic and complex Red City, is full of fascinating and unique experiences. Its mazelike medieval medina and imperial palaces are irresistible, and it’s rising in popularity as a tourist destination. Don’t miss these 12 classic and unique things to do in Marrakech whilst you’re there. The Djemma el Fna is the beating heart of Marrakech (and it’s tourist industry too). But it can be confusing to know what else to see as most of the city’s main sights are obscured in the winding alleys of the Medina. 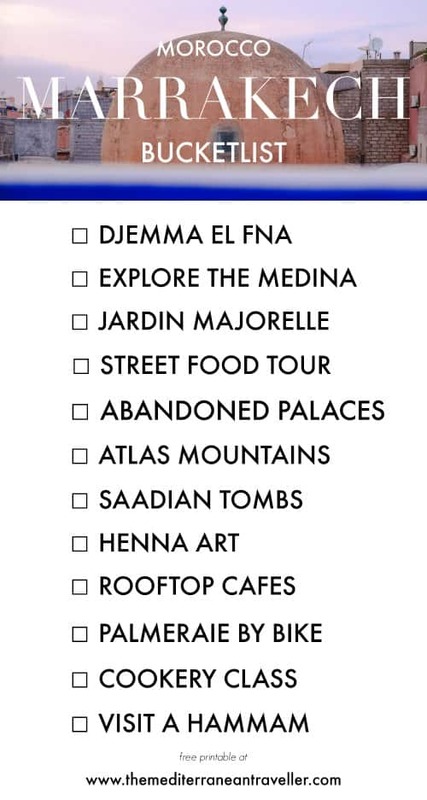 Of course, navigating the historic medina is part of the attraction. But there are a few treasures in particular worth digging out. And sometimes you have to head out of the city to appreciate what you’ve seen there, so be set aside time for a day trip or two. Here are my recommendations for what not to miss whilst you’re in the Red City. At the heart of Marrakech’s historic medina lies this famous (and UNESCO-listed) market square, which pulsates in the evenings with street food, smoke, snake charmers, and storytellers. It has various spelling (you’ll also see it written as Jemaa el–Fnaa), but you’ll have no trouble finding it as – somehow – all roads in the Medina somehow lead back to the square, making it a useful orientation point. As long as you can find your accommodation from the square, you’re all good! This goes without saying – in fact it’s probably unavoidable. And it’s utterly confounding. The longer you’re there, the more lost you seem to get! Shop for textiles and tourist knick-knacks to your heart’s content in the souk areas, but there are also plenty of quieter backstreets and community areas with schools, hammams, bakeries and markets. The main points for orientation are the Djemma el Fna, the Koutoubia Mosque and the historic Ben Youssef Madrasa (which is unfortunately closed for renovation until 2019). It’s worth hiring a guide to discover the best of the medina. For the ultimate in getting-lost fun, lantern-carrying guides will help you find your way to upscale Le Foundouk for your dinner reservation. To many, it’s undoubtedly just a garden. But the Jardin Majorelle was my unexpected highlight of Marrakech. 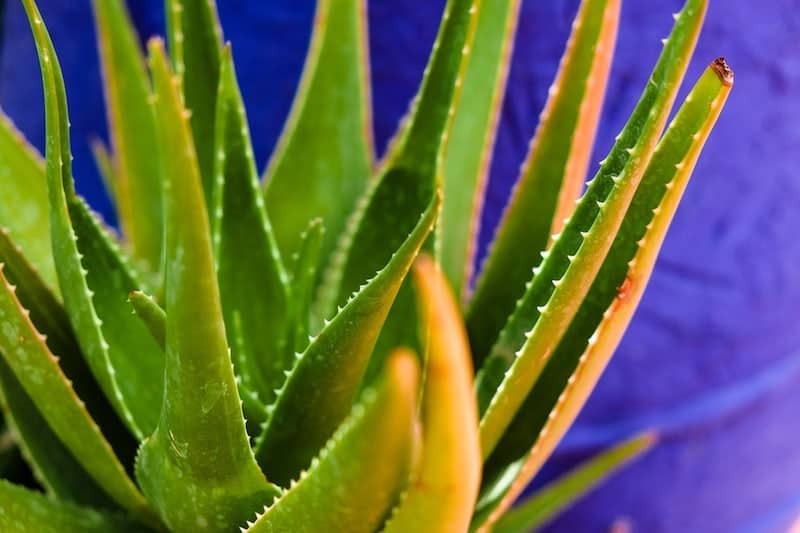 This small enchanting botanical garden is the creation of landscape artist Jacques Majorelle. Famously, it was bought by Yves Saint Laurent and then gifted to the city. It’s a must-see if you have a creative bone in your body; the colours and vision are stunning. 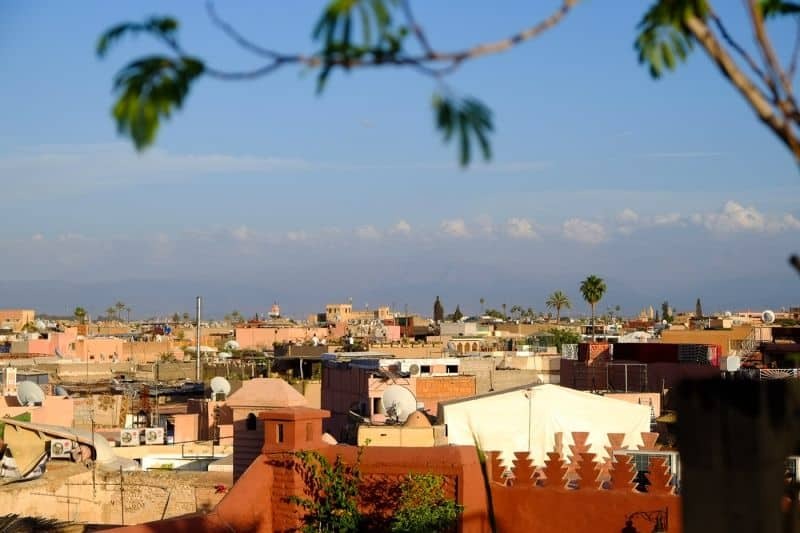 Despite being one of Marrakech’s top sites, it feels less busy than some of the other attractions – and a world away from the chaotic Medina. But best of all are the two fabulous onsite museums: Musée Yves Saint Laurent, and the beautiful (and moving) Musée Berbère. The other best thing I did in Marrakech was a food walking tour, and you can read my complete review of it here. Although it may seem expensive relative to food prices in Marrakech, these guys are the real deal and you’ll definitely discover food and experiences that you wouldn’t be able to find on your own. 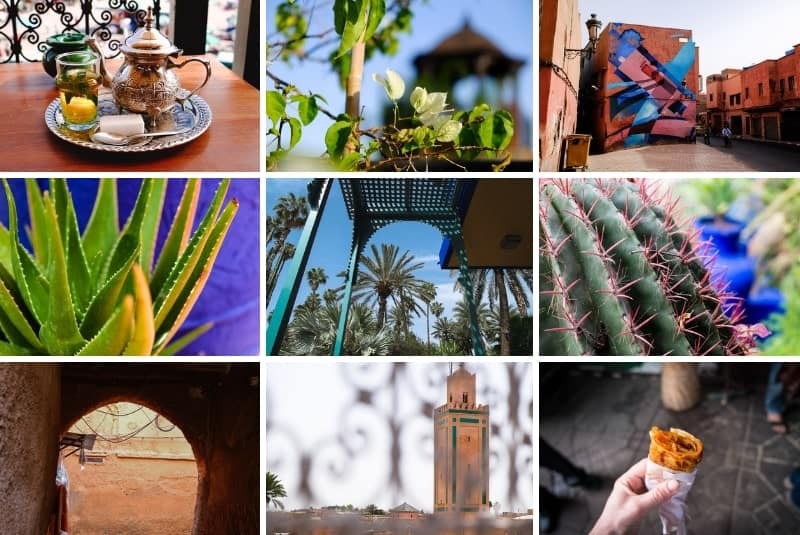 Marrakech is the ideal place to try a food tour as so much of the food culture is unfamiliar – and the medina lends itself perfectly to walking tours and storytelling. As the former heart of imperial empires, Marrakech is not short of beautiful palaces. The well-preserved Bahia and its abandoned counterpart El Badi are the big two. If you have a thing for mosaic tiles then the 19th-century Bahia will delight you. Try to avoid midday if you can, as the intricate tiles disappear under a deluge of tour groups. Whereas Bahia Palace’s ruined counterpart, El Badi, is for the Indiana Jones wannabes – the decaying romance and sunken gardens of El Badi are different to anything else you’ll see in Marrakech. Flora fans shouldn’t miss Le Jardin Secret , a 19th-century palace which has recently been opened to the public and has gardens and a cafe, or the beautiful gardens at Menara. If the heat and bustle gets too much for you, know that there are some excellent day trips you can take from Marrakech. One of the most beautiful (and easiest to arrange) is a trip to the waterfalls at Ouzoud – the highest falls in North Africa. It’s a popular trip so don’t expect to have this stunning landscape to yourself, but it’s an enjoyable day out with some great viewpoints. For fresh air, lush valleys and local culture head to Imlil, the main base for hikes in the High Atlas (including Mount Toubkal), and the Berber villages in Ourika Valley. And you’re feeling really fancy, a hot air balloon ride is a great way to see the countryside. Tucked away, this beautifully ornate 16th-century mausoleum was built by Saadian Sultan Ahmed Al-Mansour Ed Dahbi and is one of the treasures of Marrakech. What a spot to be buried! It’s small and does get busy during the day with tour groups, but entrance is cheap and it’s worth braving the crowds for a glimpse of this poetic resting place with its gilded tilework, graceful pillars and peaceful courtyard. Getting henna done is almost a rite of passage for visitors to Marrakech. Just avoid the ladies in Djemma el Fna and surrounding areas who will try to grab your arm! They’ll rip you off, if they haven’t already ripped your arm off that is. You need to be particularly careful if you have allergies. Henna art is beautiful though; if you want to get some I recommend the Henna Cafe. It’s a registered cultural foundation (and their peaceful vegetarian cafe is pretty good too). Your lips might be smacking thinking of all the delicious food, but it’s actually the drinks that left an impression on me. Perhaps because it gets so hot. Mint tea, poured from a height from ornate metal pots in one of the terrace cafes overlooking the Djemma el Fna is the classic choice. The Spice Market is another good spot. Sick of mint tea? Date and avocado smoothies are a local favourite. Fresh squeezed orange juice with mint and orange blossom is one of mine. Take home a taste of Marrakech by learning to cook proper couscous or tagine. Cooking classes in Marrakech are cheap and plentiful; your accommodation should be able to arrange one, or else have a look at the selection on Getyourguide or the list of places in my Food Guide. Check before booking whether it’s demonstration-only or hands-on though. The best cookery classes include a trip to the market for ingredients first. Swap the hectic medina for the slower pace of the Palmeriae on the outskirts of Marrakech. This huge date palm plantation contains over a hundred thousand trees and stretches for miles around. It’s also home to some of the city’s swankiest hotels – and most of its swimming pools – and is a popular excursion destination. Skip the ubiquitous camel rides (welfare standards are difficult to ascertain) and quad bikes (noisy) and instead hop on two wheels for a 2-3 hour guided bike tour. Marrakech can be a tiring and challenging destination. So a trip to one of its many hammams (public baths) is the perfect way to revive yourself after a long day. Seek out one of the small community hammams to immerse yourself in the local culture (your accommodation will be able to guide you to one). Or, if high-end pampering is more your style, reward yourself with day spa pass for the luxurious La Mamounia. LUXURY. Luxe hotel lovers are truly spoiled in Marrakech. Pick of the bunch is La Mamounia, which has the city’s most famous spa and a secret tiled room loved by fashionistas and influencers (open to hotel guests only). Similarly sumptious settings can be found at: La Maison Arabe, Dar Les Cicognes, La Sultana, L’Hotel Marrakech, Ksar Char-Bagh, Royal Mansour, Hotel Dar Zemora, Riad Farnatchi, Mandarin Oriental, Almaha, Jnane Tamsna, Riad Kniza, and Les Cinq Djellabas. BOUTIQUE. That green-tiled boutique riad you see so often on Instagram feeds is Riad Yasmine. Other chic boutique riads and mid-range options include: Riad Shambala, Villa des Orangers, Riad Mena & Beyond, Riad de Tarabel, Riad Matham, Riad El Youssefi, Riad Kasbah, Riad Kniza, and Talaa 12. BUDGET. You can find riad rooms at such great prices there’s little point staying in a hostel unless you’re looking for the social side. Equity Point Hostel is a large flashpacker hostel in a riad building. There are cheaper hostels available (Earth Hostel and Majorelle Hostel), but Equity Point is well-run with solid bunks, a central courtyard pool and a rooftop bar for watching the sunset and meeting other travellers.